Traction is one of the most important factors separating a good pair of basketball shoes from a bad pair. It’s what allows you to cross up your opponent and send them to the floor without worrying about going down yourself, and allows you to maximize your talent. 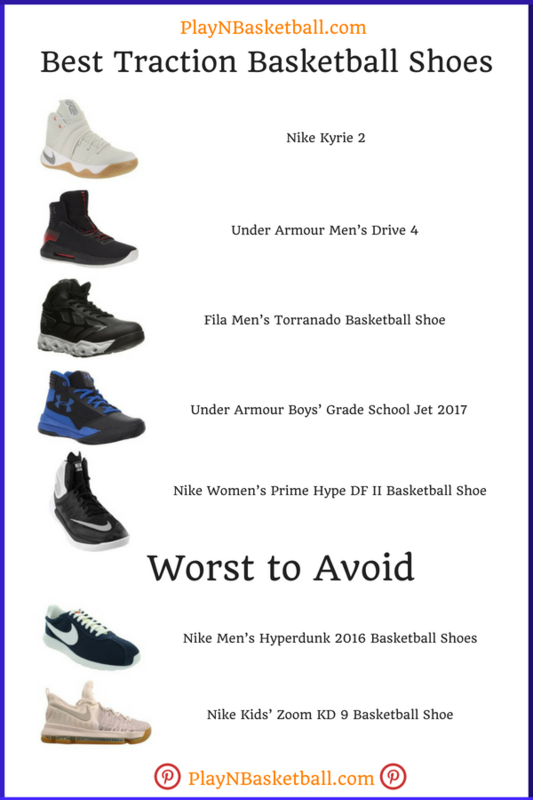 This review will help you to find the best traction basketball shoes by outlining the most important factors you need to consider in your search, as well as providing a list of the top options on the market, plus several to avoid for men, women and youth basketball players. Nike Kyrie 2 Review: The Nike Kyrie 2 is a great all-round shoe, but its best feature by a long way is the huge amount of traction it provides. Kyrie Irving is arguably the best in the business at stopping and starting, changing direction, and generally confusing his opponent to the point of no return. As a result, it’s no surprise that his signature shoe focusses on allowing you to do the same thing. These shoes are particularly good for guards who spend a lot of their time trying to dazzle their opponents. They are almost impossible to slip over in, and will allow you to toy with opposition players just like Kyrie does. These might be the best traction basketball shoes this 2019 season, and are definitely worth a try. Under Armour Men’s Drive 4 Review: The Under Armour Men’s Drive 4 is probably not as well cushioned or comfortable as many other shoes on this list, but what it lacks in these areas it more than makes up for in traction. It has a thick herringbone pattern on the sole, which makes for incredible traction on all surfaces. This shoe grabs onto the floor and doesn’t let go, meaning you can stop on a dime or change directions before your opponent will know what is going on. If you’re after a pair of shoes that is going to help you get all the open shots you could hope for, this might be the answer. They also come in very cheap compared to similar models, and are overall the best traction basketball shoes under $100. Fila Men’s Torranado Basketball Shoe Review: Fila may not have the reputation of a Nike or an Under Armour, but they still make some really decent basketball products, and the Tornado basketball shoe is one such example. This comfortable, well-fitting shoe has a rubber sole, making it appropriate for use on all surfaces. This rubber provides great traction, and will lock into whatever surface you’re playing on, be it hardwood, concrete, or anything else. Another major benefit of this shoe is the cost; being from a smaller brand, it costs a lot less than a top-of-the-line product by a company like Nike. You can find these shoes for under $50, and considering it is still a pretty good quality pair of shoes, these are definitely the best traction basketball shoes under $50. Under Armour Boys’ Grade School Jet 2017 Review: Kids invariably like sports more when they’re good at them, so buying them a great pair of basketball shoes is a terrific way to develop their love of the game. With this pair of shoes, not only will they feel comfortable and supported, but they’ll be able to perform moves that none of their opponents will have ever seen. The rubber sole of this shoe will enable your child to perform at a high level on all surfaces, meaning they don’t have to wait for a proper indoor game to show off their skills – they’ll be able to do it down at the local outdoor courts too. Under Armour have really excelled with this product, and have made the best traction basketball shoes for kids with this pair. Nike Women’s Prime Hype DF II Basketball Shoe Review: This is a great shoe for a wide variety of reasons. It provides fantastic support across the entire foot and ankle, and feels extremely comfortable to wear during a tough game of ball. Perhaps the most impressive feature offered by this pair of shoes, however, is the traction. These shoes have an anatomical outsole, which provides traction in all the areas where you need them most. With these on, you’ll be able to stop on a dime, cross up your opponents, and generally do as you please on the floor. These will genuinely make you a better basketball player, and on top of that, they look great and come in at a reasonable price. These are the best traction basketball shoes for women that you’ll find. Nike Men’s Hyperdunk 2016 Basketball Shoes Review: Nike don’t often miss the mark, but they have done so with this pair of shoes in a big way. The Nike Hyperdunk is advertized as being a shoe that offers lightweight comfort and textile lining for increased traction, but realistically this is not what they provide. They are ill-fitting and uncomfortable, and you’ll spend more time worrying about how sore your feet are than how you can get around your opponent. The traction itself isn’t anywhere near what they claim it is, and you’d probably get as much grip from a regular pair of sneakers than from these shoes. These are the worst traction basketball shoes this 2019 season, so look elsewhere. Nike Kids’ Zoom KD 9 Basketball Shoe Review: Unfortunately, it’s once again Nike who have earned themselves the undesirable honor of creating the worst traction basketball shoes for kids. With a rubber sole, these shoes are supposed to provide a great amount of traction for your kid to work with on all sorts of surfaces, but they fail to achieve this. The traction is average at best, and these shoes won’t allow your kid to develop their crossover and pull-up jump shots anything like the best traction basketball shoes will. On top of that, they tend to fall apart very quickly, meaning purchasing these shoes is not at all worth it. Brooks Women’s Pureflow 5 Review: There’s a few problems with this pair of shoes, particularly from a basketball standpoint. To start with, they are relatively uncomfortable, which will distract you from your game when you’re out on the floor. In terms of traction, they provide very little more than a regular pair of sneakers would. In a large part, this is because that’s exactly what they are, but many people use them for basketball, and if you’re looking for a pair of shoes that will provide you with good traction, these aren’t the answer. They are much better suited for wearing casually, so avoid these traction basketball shoes for women unless you’re looking for something to wear down the street. If you want a pair of shoes that are truly going to make you a better basketball player, it’s key to find a pair with great traction. Sometimes it’s difficult to know exactly which shoes will provide this, particularly since it’s a common advertising tactic for brands to claim their shoes have superior traction. This list of main points to consider will help you to find the best traction basketball shoes on the market. Sole design: This is probably the most important factor that you need to consider in your quest to find a great pair of traction basketball shoes. The sole is obviously the part of the shoe that has the largest influence on how much traction it provides, and many brands create innovative ways to increase the amount of grip your shoes will get on the floor. For example, the Under Armour Men’s Drive 4 reviewed above has a specific herringbone pattern not evident on many other shoes, and this pattern has a huge impact on their level of traction. Some basketball shoes focus more on comfort and support, which is still important, but can often result in the neglect of traction. Brand: This is the case with most aspects of a basketball shoe, but the brand of a shoe is often a good determinant of whether you can trust their claims of traction. As you’ll have noticed in the list above, Nike and Under Armour dominate the list of best traction basketball shoes, and this is for a reason. These brands generally incorporate more advanced technology into their products, and know how to create a pair of basketball shoes which will stick to the floor better than any of their competitors. Having said that, a shoe being made by Nike or Under Armour doesn’t automatically mean that it is of high quality, so it’s always worth checking out the reviews. Price: As with all products, the price is something which needs a lot of consideration prior to making a purchase. Fortunately, traction is often a feature of basketball shoes that doesn’t necessarily drive the price up. To elaborate, shoes which focus on extreme comfort or support will often cost you an arm and a leg, but it isn’t difficult to find a pair of basketball shoes with great traction that will come in at a reasonable price. Having said that, if you want a shoe which excels in all members of the important trio of comfort, support and traction, you’ll probably be spending well in excess of $100. What gives a basketball sneaker its traction? As mentioned, it’s the sole of a shoe which provides it with it’s traction. The material used in the construction of the sole, as well as the innovative patterns used by many brands to increase grip both have a major impact on how much traction a shoe will get. The best traction basketball shoes have detailed patterns on the sole of the shoe to enable you to more easily stop, start, and move laterally. If this sole is also rubber, then you’ll likely get the same result on a wide variety of surfaces, so you can show off your crossover at the local outdoor courts, or on a hardwood surface. As a rule though, a show with great traction will generally have some form of innovative pattern on the sole, which has a major impact on its ability to grip the floor surface. To really maximize your ability to find open spaces on the floor, it’s vital that you have a pair of best basketball shoes with great traction. It isn’t always easy to know which shoes will provide you with this, but using the information in this article will help. 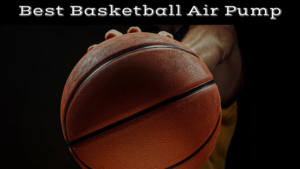 We’ve provided you with a list of important things to consider in your search for the best traction basketball shoes this 2019 season, as well as some of the best options out there to make the process that little bit easier for you.